Exactly thirty years ago, the final scene for 'The Living Daylights' was shot at Pinewood Studios. February 13th, 1987, was a pretty hectic last day of principal photography that saw both main units in action with Timothy Dalton central to in a number of minor reshoots whilst the second unit finished effects shots. 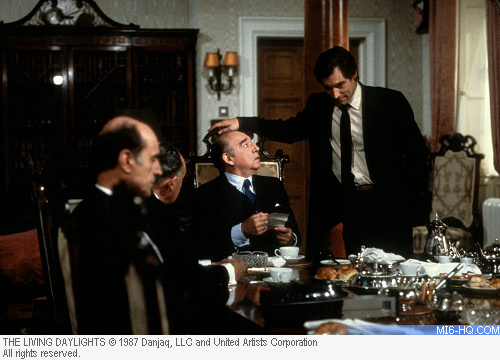 One of the pickup shots captured on the final day was of Dalton lighting a cigarette in the defection debriefing scene. 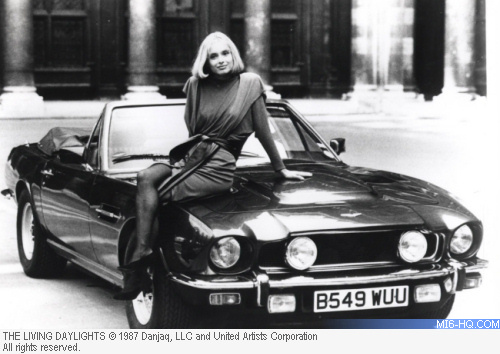 But the very last shot in the can for 'The Living Daylights' involved an insert of Maryam d'Abo touching the Aston Martin's car radio. Once 'cut' was yelled for the final time, Dalton and d'Abo were whisked away to a photo session before the rest of the cast and crew gathered at a theatre at Pinewood for the customary out-takes and blooper reel. Moderate by today's Bond films, but very long by stadards of the day, 'The Living Daylights' shot for 100 days with the first unit. With the premiere set for 29th June 1987 at the Odeon Leicester Square, London, the race was on the get the film through post-production in time.